Recently, CMOS Active Pixels Sensors (APS) have become strong candidates as pixel detectors to be used in high energy physics experiments. A very good resolution and an excellent detection efficiency could be obtained with these detectors. 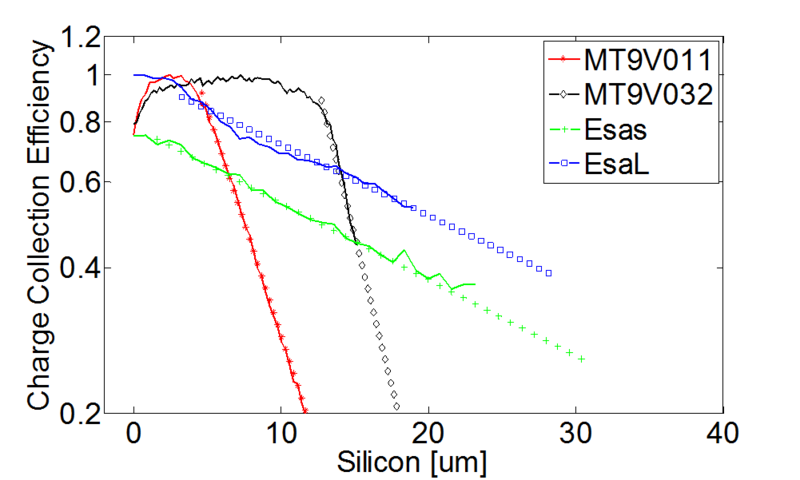 In this paper we have experimentally studied, by means of charged particle beams at a grazing angle, for four different CMOS APS the diffusion properties of electron/hole pairs formed by ionizing particles interacting within the sensitive silicon layer beneath the sensor surface. By averaging many events originating at the same distance from the surface of the device, we extracted with great accuracy the charge collection efficiency (CCE) profiles of the four sensors under test. Basic transport parameters (minority carrier diffusion length, minority carrier lifetime, width of the region at maximum CCE) have been extracted using a mathematical procedure based on the extended Ramo's theorem. S. Meroli et al, Measurement of charge collection efficiency profiles of CMOS Active Pixel Sensors, JINST 7 P09011 doi:10.1088/1748-0221/7/09/P09011.